In March 2016, the Bishop Auckland Town Team launched it’s very own mascot! 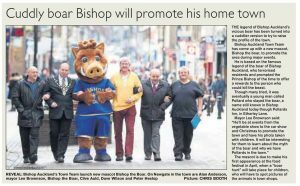 Bishop the Boar has been created to raise the profile of the town and promote the area at the town’s events. 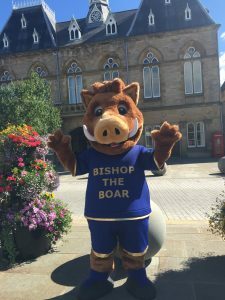 Bishop the Boar will appear at the Bishop Auckland Food Festival next month where a “boar hunt” will take place throughout the town. It’s a fun event for children to spot pictures of different boars in the town shops. The mascot is based on the legend of a fierce wild boar who once terrorised the land of Bishop Auckland, eating crops and attacking people. This urged the Prince Bishop to offer a huge reward for its capture which promoted the knight, Sir Richard Pollard to come along and heroically kill the boar (by chopping off its tongue!). Unfortunately, the brave knight fell asleep with the token of his exhausting victory – the tongue- placed inside his pocket. While Sir Richard slept, another man came along, picked up the boar and claimed the reward! When Sir Richard realised he had been frauded, he walked up to the Bishop, tongue in hand in order to prove that he had killed the beast, and, for his efforts won the Pollards area in Bishop Auckland. The book entitled ‘Pollard and the Boar: The Legend of Bishop Auckland’ is written by local historian Barbara Laurie and illustrated by Bob McManners.